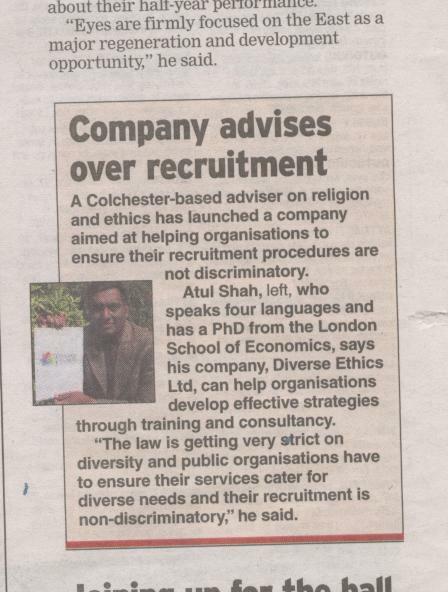 A Colchester-based advisor on religion and ethics has launched a company aimed at helping organisations to ensure their recruitment procedures are not discriminatory. Atul Shah, left, who speaks four languages and has a PhD from the London School of Economics, says his company, Diverse Ethics Ltd. Can help organisations develop effective strategies through training and consultancy. "The law is getting very strict on diversity and public organisations have to ensure their services cater for diverse needs and their recruitment is non-discriminatory," he said.